Reviews: Moog Minimoog Model D, Gizmotron 2.0, Bastl Instruments MicroGranny, MOTU 1248, Modstep, Dave Smith Instruments OB6, Fluid Audio FPX7, Steinberg Wavelab Pro 9. Features: Inside Track: Mike Posner & Seeb, John Parish. Techniques: Session Notes, Mix Rescue. Once available only to Pro Tools users, AIR’s comprehensive plug-in bundle is now open to all — and has been augmented by some intriguing additions. This handy little mixer exhibits all the qualities you’d expect from Allen & Heath, in a highly affordable and portable format. This compact module will serve as four linear VCAs or as a four-input mixer — for audio or control signals. API invented the 500-series modular format and we check out their latest addition, the 535-LA line amplifier. UK company Aston made waves with their British-made Origin mic, and now they’re back with a classy multi-pattern model. Marble is a seamless blend of synthetic and acoustic sources. Its 63 instruments are split into Harmonic, Percussive and Textures, and each patch consists of two components taken from them. Crudebyte’s iSymphonic Orchestra is an ambitious attempt to pack a full orchestral sample library into an iOS device. The curious Gizmo polyphonic guitar sustainer is reborn. Can this new version succeed where the original failed? This inexpensive and conceptually simple plug-in, compatible with all iZotope’s usual Mac/PC formats, applies the principles of the Shepard Tone to filtering. 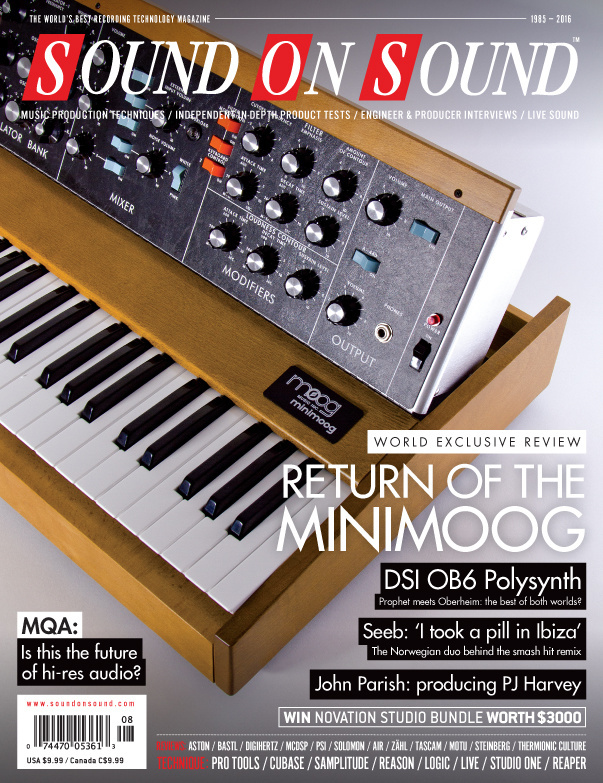 Soon, for the first time in 35 years, you will be a able to walk into a shop and buy a brand-new Minimoog. But will it be as good as the original? Find out in our exclusive review. Designed by PandaMIDI in Hungary and inspired by the long-discontinued Akai Deep Impact, this unit adds a useful range of extra features. The pop filter is one of those humble yet essential devices that you normally don’t pay too much attention to — which seems strange, really, when you consider that it’s the first thing in your vocal recording chain. Designed to produce a wide range of mono or stereo delay-based effects, StompDelay's inbuilt multi-waveform modulation allows it to double as a flanger, chorus, tape echo or extreme effects generator. This mic offers an elegant means of getting that ‘reverse speaker’ kick drum sound without you having to butcher your NS10s! It’s an audio interface. It’s a digital mixer. It’s an eight-way microphone preamp... but how well does the US20x20 perform in use? TC’s HyperGravity compressor pedal is unapologetically digital and is based on the algorithms developed for TC’s high-end System 6000 platform. Combining characteristics from various classic equalisers, including the designer’s originals, the Swift isn’t quite like anything else. Based upon a sampled Steinway B-211, the addition of an impressive library of MIDI performances makes creating that perfect piano track as easy as possible. Early last year the Viennese company supplemented their Choir with a much-requested library of solo voices, which we examine here along with other VSL releases. Zähl Audio’s consoles have long been cherished by professionals, and this unit should bring their sound to a wider audience. Cubase’s Groove Agent SE4 isn’t the most intuitive drum machine, but it’s well worth getting to grips with. Give your musicians the right cue mixes in Studio One, and you’ll make a huge difference to their performances. What you don’t like about Reaper, you can probably change! We look at the different ways in which you can animate parameters in Ableton Live. Easily play and write in any key with Logic Pro’s MIDI tools. Audio files to accompany a selection of this issue's articles. The Silent Majority: sometimes the best way to improve a mix is to take a break from it. We clear up some of the issues surrounding cloud collaboration in Pro Tools 12.5. The Don Camillo Chor: Our engineer records a choir singing in their practice room, and tries to make it sound like it was captured in a church! We look at what’s new in Reason 9 — including the power to change the background colour. Is it time to burn a few musical bridges, experiment with a more Eno-esque approach, and turn off the click track? PJ Harvey’s long-term co-producer John Parish is uncompromising in his willingness to experiment — even with the world watching! There are two commodities that, if we don’t get in check, will massively affect the quality of recorded music: space and skills. Q. Should I use more than one master bus for processing? I increasingly hear people extolling the virtues of a multi-bus system for mix processing, where you mix everything to a handful of parallel submasters, each with its own master-bus-style processing, before passing a mix of all those to the overall master bus. What’s the rationale behind this technique? Read more about Q. Should I use more than one master bus for processing? Perhaps the only classic Hollywood recording studio of this type that is still open today, Boulevard began as Continental Recorders around 1966. It changed name to Producer’s Workshop, before going on to create musical history in the 1970s. Persistence is a virtue every composer needs, but you can take it too far. Media content for the August 2016 issue.